I do not believe in God. This is partially due to the manner in which my parents raised me. Although my father identifies as Baptist and my mother as Catholic, the one institution they always held in higher regard than religion was education, so I was always sent to whichever school they felt would give me the best advantage in learning. I attended parochial, secular and Jewish schools, and while my mother was very generous with sharing her faith, I never received marching orders from home about what to believe or not believe. I initially believed in God because it was convenient, a socially acceptable invisible friend who listened to me when adults couldn’t understand, and sat with me whenever I felt alone. Later, as I began attending Catholic schools, belief became a reflexive survival trait. There were certain motions to be made in order to meet the standards imposed by my religious environment. Then belief became a necessity outside of school. Familial hardship, no worse than what many go through, turned us all to prayer, prayer for guidance, for money, for jobs and for a sense of love to return to our home. Every time there was a respite from the hardship, there was much laughter and back slapping; God had answered our prayers. The respites wouldn’t last and as I entered my last two years of high school I simply stopped caring. I was unmoved by the religious devotion of those around me, and sought none for myself. 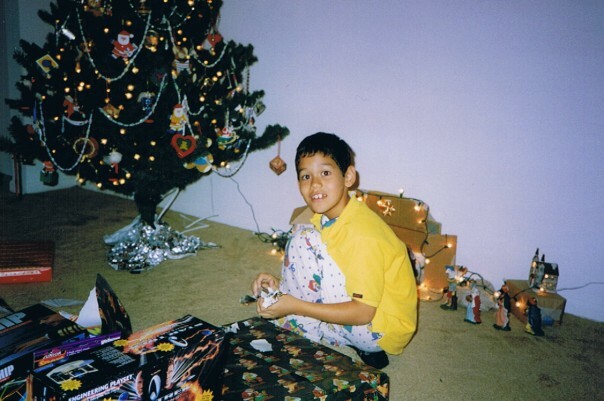 Matters finally improved for my family after high school, without my having to pray for it, and it was also during this time that I started to educate myself about the way of the world outside of my own limited experience with it. This was helped by the fact that I had moved to New York City, and for the first time I began to think critically about what I had believed and why. I thought about the people who gave me God and realized that their reasons for belief were no different than mine had been: someone else simply gave it to them, and they never saw a reason to seriously question it or the giver. Realizing this, the authority from my own givers vanished and I embraced the first real sense of ideological freedom I’d known until then. No guilt, no fear, no more begging and no more waiting. I was a cliché, a believer turned atheist by university, but I was content and fulfilled, or so I thought. But then I found the writings of one Christopher Hitchens. It was certainly a tricky time to become a fan of his. Bush had just been re-elected, and Hitch’s politics definitely leaned to the right. He would even on occasion defend things like the genocide of America’s indigenous population or the invasion of Iraq. He thought abortion should be illegal. His views towards women in general, while never immoral, were dated and, at worst, condescending. These were things I didn’t like about him then and still don’t like about him now. He was also a very outspoken atheist, but if one is simply looking for thorough arguments for the non-existence of god, or the inherent corruption of religious institutions, there are still better sources. More than anything, Hitchens was indefatigable. No one put themselves out there more than the Hitch, and no one spoke with as much pointed assertion as he did. 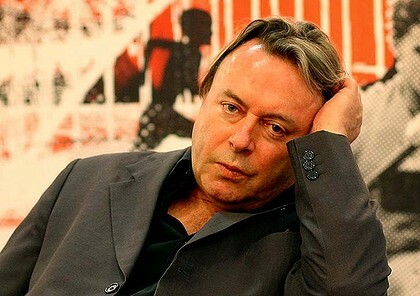 Among the four horsemen of the New Atheist movement, himself, Daniel Dennings, Sam Harris and Richard Dawkins, Hitchens may have been the non-scientist, but he was the most capable of delivering the anti-theistic rationale in quotable, humorous, but no less substantive fashion. The Four Horsemen of New Atheism. 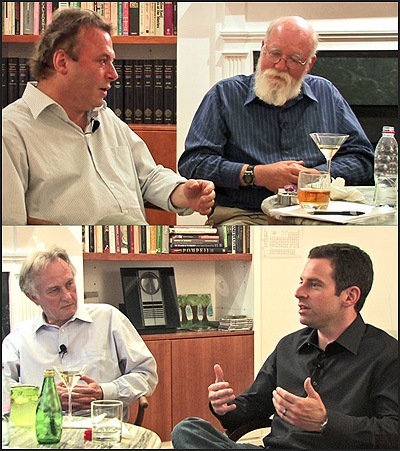 Clockwise from top-left, Hitchens, Dennings, Harris and Dawkins. Christopher Hitchens helped me nurture my own stance on faith and how to discuss that stance openly, proudly, but always with a desire to learn more about the universe that informed it. It is under that evolutionary context that I think he offered his most astute portrait of religion. It was our first attempt at law, philosophy, science and reason. And like any first attempt, it was imperfect and we replaced it with more accurate methods of interacting with the world around us. As useful as it had been, a time came when we had to grow up and let go. I was always impressed by this big-picture view of religion, and I think it’s one many can apply to their own lives: knowing when to let go of our first, imperfect attempts at understanding, and always looking for a better way. I have tried to do so in my own life, in manners certainly imperfect, but I have tried nonetheless. Attached below is one of my favorite moments of Hitchens being supremely reasonable, what his fans affectionately call a “hitchslap.” I hope someone will pick up the baton and work as hard and as publicly as he did in the name of reason and compassion, but for now I will settle for these videos. Christopher Hitchens, I will miss you. Posted on December 17, 2011, in The Manifestos of Don Manifesto and tagged atheism, christopher hitchens, dawkins, dennings, faith, god, harris, hitch, religion. Bookmark the permalink. 1 Comment. Nicely said Andrew. I think the key is critical thinking. You were fortunate to have an educational background that produced a critical thinker. Very few are as fortunate. We are definitely not born with that quality and as a result are often pegged non-conformist, conspiracy theorist, hater, “going to hell,” or just plain crazy. I was a never a big fan of the Hitch but admired him from a far and respected his intellect and writing. He, like Michael Moore, Ron Paul, Ralph Nader and others, may not always say or do what you want but they always make you think and that is why I believe they are often so vilified. The smart ones in power or as I call them “the thinkers,” do not want the message of these folks to proliferate, they want them to be ridiculed and destroyed to the point where people will openly celebrate their lack of critical thought with pride thus keeping the rich and powerful atop the food chain.